During a hard time in my life, I was looking for direction but no one to give it to me. I was feeling that what I was doing wasn’t going to be what I wanted to do for the rest of my life. 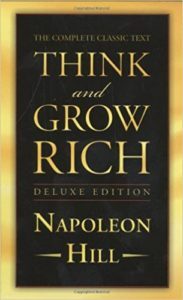 I told a friend, and he suggested I read “Think and Grow Rich”. After I finished reading, I started listening to mindset podcasts and lectures online. After thousands of hours of listening and reading, I was thrust into the psychological atmosphere of thought and these would be the books I would have began with, in terms of finding what it is I love in life. So this post is what I would have prescribed myself while I was in that hard place. All of these books, in my opinion, are must reads for anyone trying to find out what it is in life that they want to do. I am going to limit the reading list to 3 books to prioritize the most effective books. I’ve watched thousands of hours of podcasts and spent hundreds of hours of reading books on the most effective ways to live life. These books would be the books I would have told myself to read as soon as I was curious enough to have the longing for exploring what life is and what makes life great. I would prescribe them in the following order too. 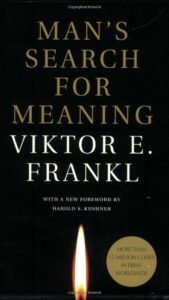 This book is on Logotherapy, the pursuit of that meaning for one’s life. Jewish Psychiatrist, Viktor Frankl, lived in Auschwitz for 3 years studied the behaviors and actions of prisoners within the concentration camps during WWII. He was focused on what was keeping the prisoners alive and what killed the prisoners, from a psychological perspective. The book is around 95 pages. This book was suggested by Dr.Jordan Peterson and Tim Ferriss, Chase Jarvis, Lewis Howes, etc. 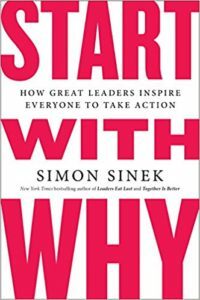 Simon Sinek frames the idea of starting with a Why around sparking inspiration in others to excel and achieve. He did massive research into companies like Apple and how they started. He argues that they started with a why and if you haven’t seen his Ted Talk, start here, Simon Sinek Ted Talk. He explains that when people see the motives behind someone’s actions, they can connect and follow what they are doing much more strongly than if they didn’t know why they were doing certain things. This book was gifted to me by Nick Elcott, a great friend of mine. I plan on reading it again soon. Napolean Hill was the mentee of people like, Andrew Carnegie, Alexander Graham Bell, Woodrow Wilson, and many others. They all taught him their perspectives of life based off of personal experience and the information they gave has been relevant for almost more than a century of pillars of thought. The book goes into everything from organization to the subconscious. The book is very high level in the science of it’s material, but the ideas of the subconscious have now been proven by science and this book, written in 1922, still stands the test of time. I would also recommend taking what he says with a grain of salt for the ideas he portrays about money. You could change the word, “money”, to “success” all throughout this book an it would still flow just fine. Book was recommended by Daymond John, Scott Adams, Lewis Howes, and others. This was the first book that I read that really taught me that I could use my mind to do things I never thought possible. This book changed my focus of learning to somewhat more of a psychological direction. These books are the stepping stones that point me in a direction of personal development and how important continuous learning is in a livelihood full of life, love, and the pursuit of happiness. “Essentialism” – Greg Mccown – Cutting out the things that aren’t needed so you can focus on the things that are. “Wherever you go There you Are” – Jon Kabat-Zin – Using meditation and mindfulness to BE and always be where you are, instead of reminiscing in the past or future. “Tribe” – Sebastian Junger – How people act when they are put into groups. The good and bad of comradery and the anthropology of our ancestors and what drove them as humans. “Tribe of Mentors” – Tim Ferriss – Best life advice from the best in the world.